We downsized; we are making this trip in a smaller boat. Smaller compared to what, you ask??? 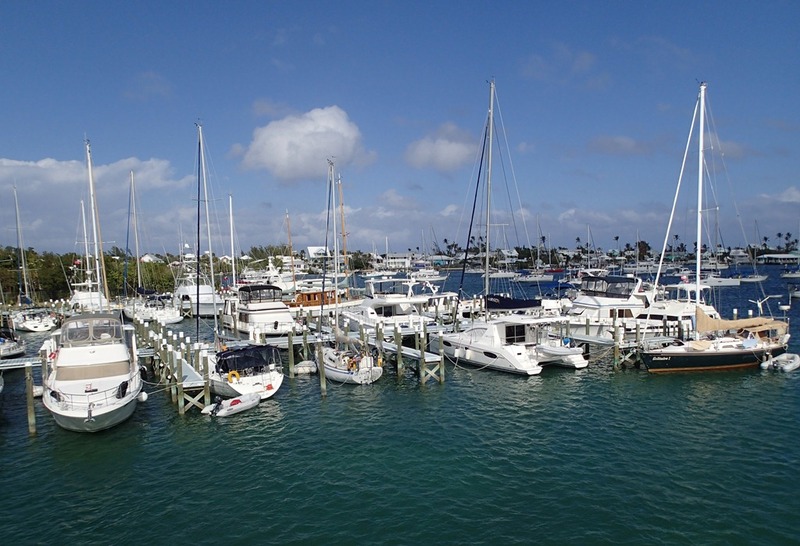 Just look at the boats surrounding us in the Hopetown Marina. We’re the little bitty one in the middle, with the blue stripe and yellow life ring. When we did the trip In 1995-96, we traveled from Detroit, Michigan, to the Exumas in the Bahamas in a center-cockpit, aft-cabin, aluminum, Shore 41, “Victory.” It was the perfect boat for us then, making the trip with two kids, aged 8 and 11. Victory had lots of storage, two cabins and two heads, a great big shower, hot water, a frig and freezer, a four-burner stove with broiler, dinghy davits, a fixed dodger and bimini, a big flush foredeck, an easy rain catchment system, and a separate engine room so repairs did not require tearing apart the entire boat. She had a linen cabinet, a storage rack for four pairs of shoes/boots each for four people, plenty of book cases, and a very large galley. We took tons of stuff, even my sewing machine – which I used. Goldwin had a full array of tools, including a sawzall and air compressor. Did I mention the kids’ treasures? But not this time. Now it’s just the two of us and, like friends who have left their 3-bedroom, 3 1/2 bath homes for a condo in the city, we wanted to downsize. We wanted to live a simpler life, which meant that we didn’t need all the stuff we have at home – or even all the stuff we brought with us in 1995-96. And we wanted a boat that was easier to work on and easier for us, (now older) to sail. First we had to decide what was most important to us – but that has to be done whenever a different boat is being contemplated. Even though it would be smaller, we still wanted a solid, well-built boat that was offshore capable and would give us a comfortable ride. The Camper Nicholson 31 satisfied those requirements. Plus, she has good storage, excellent tankage, a nice layout, and standing headroom. The Nicholson also has a tiller, outboard rudder, and full keel, which my husband favors. The tiller, which stows upright, gives us more useable cockpit space than many larger boats whose cockpits are overwhelmed by their massive wheels. Down below, the Nicholson is compact, but cozy. The seating area in the main salon is comfortable; we have a fixed table that can be folded out in two sections – it’s great for two, easy for four, and possible for six. 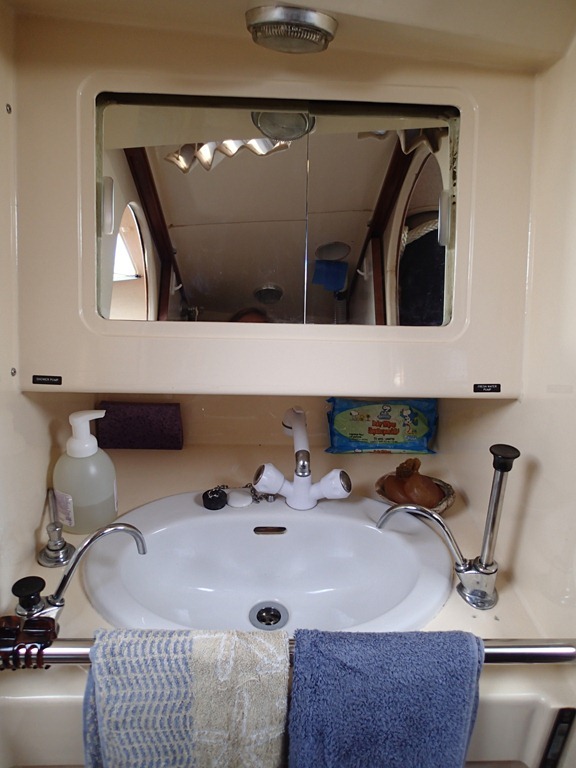 The head has a good-sized sink and mirror, with full length sliding doors fore and aft for privacy and a shower via a handheld wand on the sink faucet. For hot water, we use sun showers. I like a boat shower that also cleans the entire head area while you shower, i.e., one that uses the whole area as a shower stall. You wipe it down afterwards and, voila, all clean – you and the boat. 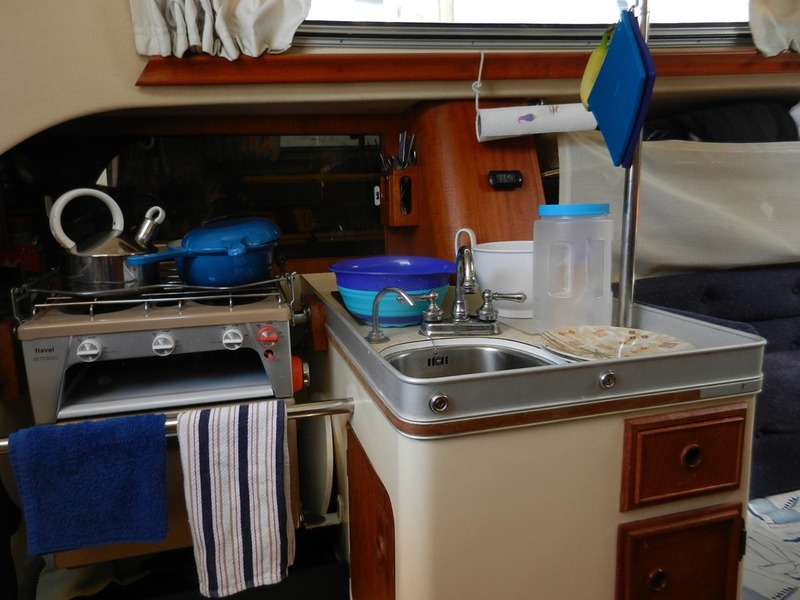 Generally, I like to cook simply, so a small galley is workable; I just need more counter space. The stove on the Nicholson is original and, bless the English, it makes the best toast I’ve ever had on a boat. It’s not really a broiler – it’s just a toaster (that white area just below the burner knobs). But a toaster in the broad sense, that can handle hors d’oeuvres and open face sandwiches, etc. And even when I had a four burner stove, I rarely used even three of them at a time. So a two-burner is just fine. The bunks in the v-berth area surprisingly comfortable, plus there is some standing room and a bit of storage. We can each get in and out of our bunks fairly easily, which is great for our older bladders. 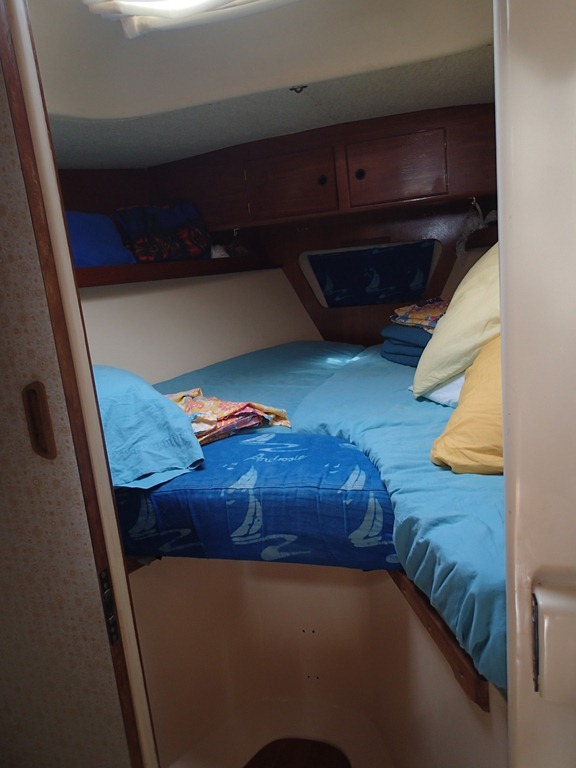 Even in the Shore 41, although our aft cabin was very large, (we even had transom ports, which Goldwin installed), the offset queen-size bed had only one exit/entrance, so I had to crawl over my husband to get in and out of bed. A smaller boat is easier to work, maintain, and repair. It goes without saying that 31 feet of boat is easier – and cheaper — to paint than 41 feet and that hauling a 35 lb. anchor is easier than a 60 lb. CQR – even the chain is smaller. We are not as strong as we used to be and we do not wish to add more gizmos to our boat to help us, e.g., bow thrusters, hydraulics, power this and that, etc. Bottom line is that we like a simpler life and smaller helps to accomplish that. We don’t have to worry about a watermaker or electric winches or a hot water heater. We don’t have to pay for them or fix them or make/buy electricity for them. And we don’t need them for this trip. Everyone has to decide what their trip will be and what they need or would like for that trip. Then find a boat that meets those needs/wants or change the boat you already have – or a combination of both. Just make sure you don’t spend TOO much time getting the boat ready. The key to taking a trip is leaving the dock. Shockingly, we’d only spent one night on the boat before we left, but luckily, the Nicholson 31 has turned out to be just what we wanted. That brings back many memories of Victory and the day you brought her home. I love your new boat, looks like just the right size for the 2 of you and you are right as you get older you are looking for simpler things. Have Fun!!! You have just explained “Utopia” to me. 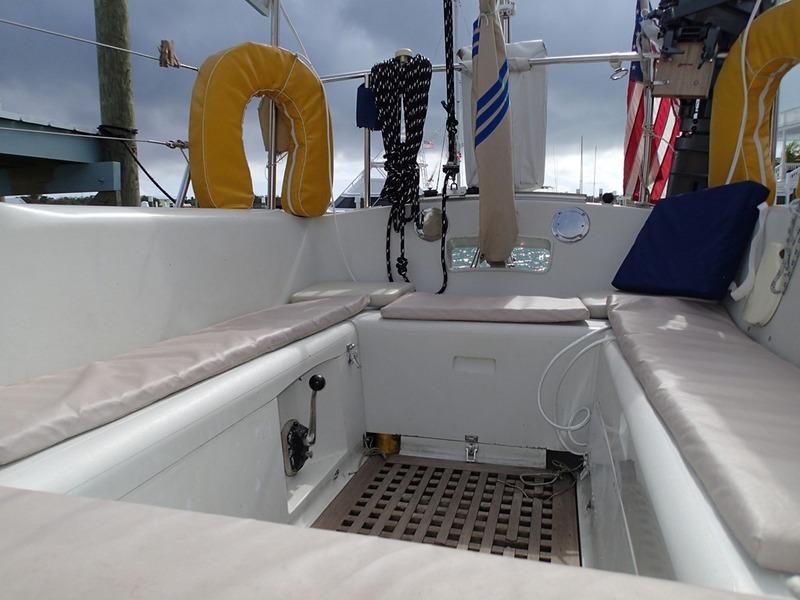 I love your phylosofy of a smaller boat, as we sail a 29… Just under and often question, is it big enough? I have always been of the mind that a trip is what you make it! And I believe that… Thank you ! Very interesting, great virtual tour. You boat is so tidy! Hahahaha. Just for the pictures. No, wait — all the time, of course. The mention of the anchor weight on a smaller boat, galley size, the tiller and the auto piloting are good all things to consider. And consider maintenance, size versus costs too. 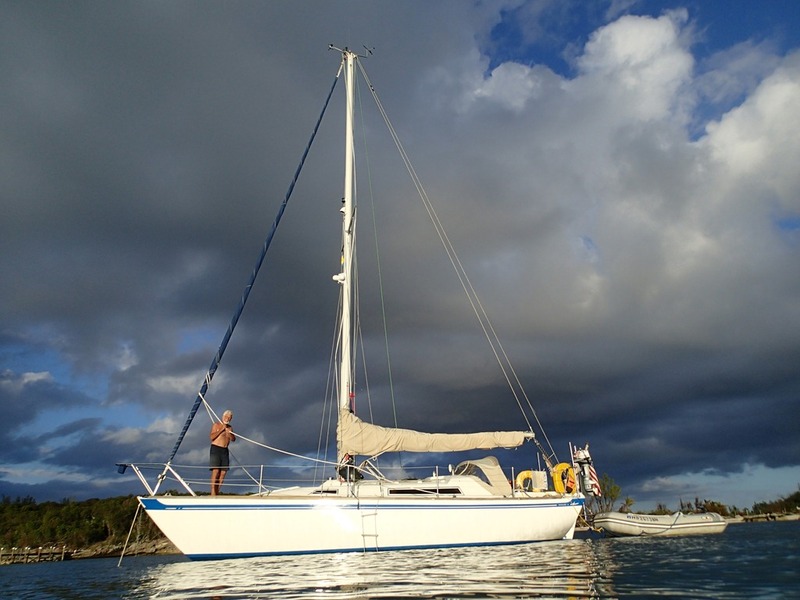 What size/type is best for a first sailing boat for two novices? Could you point me in the direction where to look for ideas? 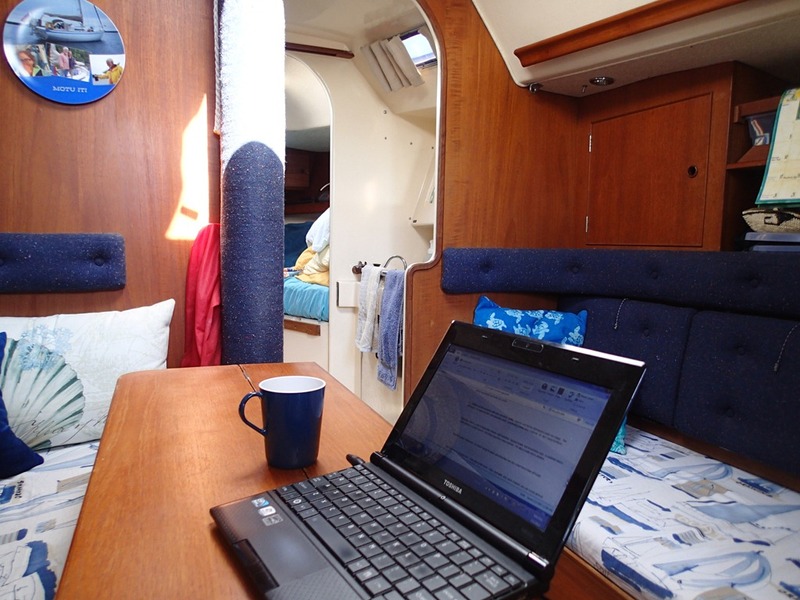 I will email you some things to consider in selecting a boat that is “right” for you. Bottom line – you have to love your boat. Makes me think of our little pop up and the trips we have taken with it. But we are actually hoping to up size, just a tad, so that we don’t have to pop up and down every time we move. But boy, even a tiny trailer seems so big by comparison! Isn’t it nice to cook so small altho I sure wish for just a tad more counter space as well…have none! Just the table or on the bed. Thanks for sharing pictures and story of life “on the small”.